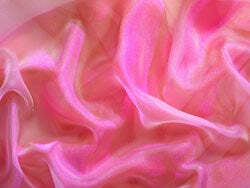 BB Crafts offers an extensive range of Two-Tone Organza Overlays used to add a personal luxury and color to your decoration that any other fabric will not give. Our premium quality of two-tone organza overlays developed from 100% nylon used for wrapping, table decorations and much more. The soft materials shine in two beautiful vivid colors provides a unique and appealing finish to the material. Available in size 28 inch x 108 inches. You can easily choose the type of color combinations that can mix up with your craft works and give an admiring look to your accessories. So, make your home rooms fabulous with our two-toned overlays that add value to your drapes, wall hangings, and curtains. We offer a huge variety of shades and color combinations that are available in this fabric at an affordable price but make sure select the one that will attract others. For more information, visit our website and shop for an exclusive range of combinations in two tone organza overlays!